Over the course of a single generation, without significant discussion or debate, a key practice of traditional medicine was almost completely abandoned in mid-nineteenth-century Europe. 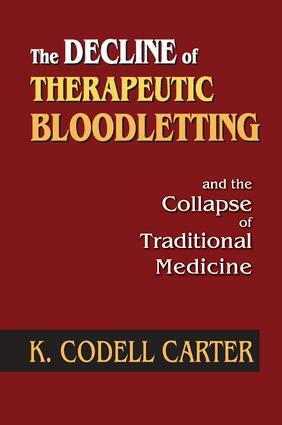 K. Codell Carter's book describes how and why bloodletting was abandoned, noting that it was part of a process in which innovation was required so that modern scientific medicine could begin. This book is a masterful study on the collapse of a traditional medical practice. Bloodletting had been a prominent medical therapy in early nineteenth-century Europe and can be traced back to Greek and Roman physicians. The Hippocratic corpus contains several discussions of bloodletting. Galen, the most famous physician in classical antiquity, wrote tracts explaining and defending the practice. It was employed in ancient Egypt and is the most commonly mentioned therapy in the Babylonian Talmud. Indeed, it was practiced in virtually every part of the ancient world. Even though the practice abruptly ceased, there was little argument against it or reason to believe it ineffective. In reality, bloodletting actually worked. However, the rise of modern medicine required not just a change in how disease and causation were conceived, but also a change in the role of medicine in society. It has been claimed that the collapse of traditional medicine was a precondition for the rise of modern medicine, but there has been little support for this assertion before now. Carter provides this missing support. The result is a fascinating study in the history of medical practice and social expectations.